This popular small fruit bears plenty of berries that are delightful when eaten fresh, used in pies, muffins, or pancakes, or added as a fruit topping for breakfast cereals. Also, blueberry plants add beauty to the landscape when grown in beds, rows or as a hedge along the property border. Blueberry-growing presents a challenge because the plants require soils that are acid, well-drained, loose and high in organic matter. These types of soils are not common in most areas of the state. However, blueberry plants can be very long-lived (25 years or more), so the considerable time and expense in preparing the soil is well worth the effort. There are three main types of cultivated blueberries that can be grown in the Southeast: rabbiteye, Southern highbush and Northern highbush. This fact sheet focuses on the rabbiteye and Southern highbush types, as they are more adapted to the South Carolina climate and soils. In general, rabbiteye blueberries (Vaccinium virgatum) are the most adaptable, productive and pest-tolerant of the three types of blueberries. Except for higher mountain elevations, rabbiteye cultivars are adapted to all of South Carolina. In general, rabbiteye blueberries have a great degree of self-incompatibility; therefore, a minimum of two varieties is required for adequate cross-pollination to ensure maximum fruit. Chilling hours are listed for many cultivars, and this requirement means that the blueberry plants need to be exposed to a sufficient number of hours of winter temperatures below 45 °F in order to produce flowers. The chilling hours in SC range between 1000 to 1200 hours in the upper Piedmont to as low as 400 to 600 hours near the coast. Southeastern U.S. Region map showing approximate minimum number of chilling hours by state/region. Note: four chilling hour zones for South Carolina with yellow arrows. The following rabbiteye cultivars are recommended in South Carolina. Climax: Plants require 450 chilling hours. This cultivar has a concentrated fruit set with small to medium sized fruit. Recommended cross pollination with Premier or Austin. Krewer™: PP 28623. Requires 400 to 450 chilling hours. Fruit are very large and have a very favorable firmness and sweet flavor. It is a companion to Titan and suitable for commercial growing, pick your own operations, and home gardens. Vernon: PP19291. Requires 450 hours of chilling. Flowers 7 days after Climax, but ripens before Climax and Premier. Fruit are large, firmness is excellent, and have good flavor and color. Recommended cross pollination with Alapaha. Alapaha: PP16266. Requires 450 to 500 chilling hours. This cultivar has a medium size fruit with good firmness and flavor. Flowers 7 to 10 days after Climax, which helps avoid spring freeze damage to flowers. Recommended cross pollination with Vernon. Austin: Plants require 500 chilling hours. Plants are productive and produce medium-large berries. Recommended cross pollination with Climax or Premier. Titan™: PP24135. Requires 500 to 550 hours of chilling. Fruit are very large – larger than Vernon or Premier. Flavor and color are good, but fruit may crack under wet conditions during ripening. Recommended cross pollination with Vernon and Krewer. Premier: Requires 550 chilling hours. Plants produce medium to large sized fruit. Recommended cross pollination with Austin or Alapaha. Brightwell: Requires 400 chilling hours. Fruits are medium to large size, but may split during wet weather. Recommended cross pollination with Austin or Premier. Powderblue: Plants require 600 chilling hours. Plants have good production of medium sized, light blue fruit. Recommended cross pollination with Tifblue or Brightwell. Tifblue: Requires 650 chilling hours. Plants produce small to medium size fruit, which must get fully ripe or they will be tart. Baldwin: This late maturing cultivar requires 450 to 500 chilling hours. The plants have moderate yield and high vigor. The fruit are large, of good quality and very dark blue color. Cross pollinate with Brightwell, Powderblue, and Centurian. Centurian: Centurian plants need 550 to 600 chilling hours for fruiting. The fruit are very good quality, medium-sized, firm, and darkish-blue. The fruit may crack with heavy rainfall. Pollinate with Brightwell, Ochlockonee, and Powderblue. Ochlockonee: PP17300. Requires 650 to 700 chilling hours. This cultivar is very productive with fruit larger than Tifblue. Fruit has good color, firmness and flavor. Recommended cross pollination with Powderblue. Onslow: This cultivar has fruit slightly larger and darker than Powderblue. For fruiting the plants require 500 to 600 chilling hours. The plants are productive and vigorous. It has been reported that Onslow may tolerate soils of a higher pH than other cultivars. The fruit are large, with very good firmness and a medium blue color. Southern highbush blueberries are hybrids derived from crosses between Northern highbush blueberries (V. corymbosum) and native Southern species, mainly Darrow’s evergreen blueberry (V. darrowi). 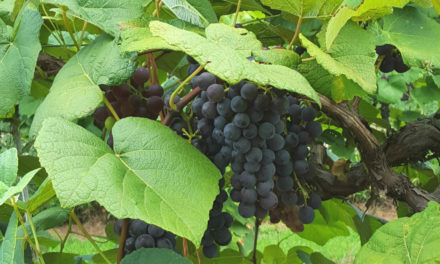 Southern highbush cultivars, in addition to lower chilling requirements, also have greater tolerance to high summer temperatures, somewhat greater drought tolerance and develop superior fruit quality under Southern growing conditions. Mulch plants with pine straw to conserve soil moisture, but do not over-water Southern highbush plants if grown in heavy, poorly drained clay soils. As a rule, Southern highbush blueberries are self-fertile. However, larger and earlier-ripening berries result if several cultivars are interplanted for cross-pollination. The following Southern highbush blueberries are recommended for the home garden. Georgia Dawn™: PP16756. Plants require 300 to 400 chilling hours. Fruit are medium to large size with a medium dark blue color. Fruit have acceptable firmness with outstanding flavor. Plants are vigorous growers and very early ripening. Recommended cross pollination with Rebel. Palmetto: PP17656. Chilling requirement is 350 to 450 hours. Fruit are medium sized with a medium dark blue color with acceptable firmness. Plants are very productive and have good vigor. Recommended cross pollination with Suziblue. Rebel: PP18138. Plants require 400 to 450 chilling hours. The fruit are large with good to excellent color and firmness. Fruit can become bland if they remain on the plant too long. Plants are productive. Recommended cross pollination with Suziblue. Southern Slendour: PP22692. Fruit are medium to medium-large, very firm and with outstanding flavor. Plants produce a medium yield. The chilling requirement is 450 to 550 hours. Recommended cross pollination with Suziblue. Blue Suede™: PP21222. Plants are productive with attractive light blue fruit. Fruit are large and flavorful. The chilling requirement is 500 to 550 hours. Recommended cross pollination with Camellia or Palmetto. The fall foliage has a deep red color. Summer Sunset™: PP applied for. Chilling requirement is 500 to 550 hours. Fruit are medium sized and multi-colored as they go through the stages of ripening (first yellow-green, then orange-red, to red, to purple, and finally black). The plant is vigorous. Recommended cross pollination with Titan. Suziblue: PP21167. The chilling requirement is 400 hours or less. This cultivar has fruit that are large, with very good firmness, and good flavor. Plants are vigorous. Recommended cross pollination with Rebel. Camellia: PP18151. The chilling requirement is 500 hours. The fruit are large, firm and flavorful. The plants are vigorous growers. Recommended cross pollination with Suziblue. Two-year-old bare-root nursery plants 1 to 3 feet tall are transplanted in late winter or early spring. Potted plants can be transplanted in the fall. Growth begins with bud swell in the spring and continues into late summer and fall. The blueberry produces several flushes of rapid shoot growth. Each growth flush ceases when the uppermost or apical bud aborts (this is not a disease). Soon after, a bud “breaks” near the tip to begin another flush of shoot growth. Each shoot may experience several of these growth flushes during the season, and each flush may result in 6 to 10 inches of growth with adequate moisture and nutrition. Shoot growth usually stops in midsummer. Typically, five to eight flower buds can develop on a healthy shoot. Each flower bud can produce from five to 10 flowers that continue to develop inside the bud throughout the fall and early winter months. Both vegetative and flower buds become dormant in winter. Flower buds open sequentially in the spring, with the flower buds on the tip of the cane opening first. The flowers inside a bud open up in a similar sequence with the flower nearest the tip opening first. Shoot thickness affects blooming sequence, with blossoms on thinner wood opening up earlier than buds on thicker wood. It is best to remove all flower buds in both the first and second years after planting to stimulate good shoot and root development. Blueberry flowers and fruits sap considerable energy from the plant, and fruit yields in subsequent years can suffer because of poor plant development in the first two years of establishment. In addition to removal of the flower buds, head-back the top one-third to one-half of all shoot growth on rabbiteyes at the time of transplanting. Blueberry fruit ripens over a two-month period after bloom. This will vary with the cultivar, weather conditions and plant vigor. Plants should produce about a half-pound per bush in the third year, and 1 to 2 pounds per bush in the fourth year. With good care, mature Southern highbush plants can produce more than 8 pounds of fruit each year. Rabbiteye can produce 12 to 25 pounds. Soil pH Adjustment: Have a soil test taken in the fall before planting in late winter or early spring. If the pH is above 6.0, select another planting site. If the soil pH is below 6.0 but above the 5.5 limit, apply wettable sulfur (90 percent sulfur) or aluminum sulfate. A very low soil pH caused by excess sulfur can be detrimental. Some soils in the Piedmont are very high in manganese. When growing blueberries on these soils, keep the pH above 5.0 to avoid problems with manganese toxicity. Any sulfur applications should be made at least three months prior to planting because it takes several months for sulfur to reduce the pH. Check the pH once or twice during the first growing season to determine if still more sulfur is required later in the season. Sometimes, the impatient home gardener will insist on planting without a soil test. In this case, mix 1 cubic foot of peat moss with an equal amount of sand. It is important to use a sand that has not been limed or that does not contain a liming material. Most builder’s sand, referred to as “sharp” sand, does not contain liming materials. Soil Water Drainage: On a heavy clay soil or a soil that sometimes remains wet, apply the peat-sand mixture to the soil surface and plant. If the soil has good drainage, part of the peat-sand mixture can go in a hole or furrow several inches below the soil surface. However, leave enough of the peat-sand mixture to form a mound (for single plants) or a ridge (for a row of plants) at least 6 inches above the surrounding soil surface. The mound or ridge will protect plants from excess water; however, with this method of planting, water thoroughly two to three times per week during dry spells in the summer and early fall. Logs, landscape timbers, stones, bricks or concrete blocks can be used to contain the soil mixture in the raised bed. Preplant Additions of Organic Matter: Blueberries are naturally adapted to high organic matter soils where soils have 3 percent or more organic matter as opposed to most mineral soils with organic contents usually less than 1 percent. Organic materials such as peat moss, composted pine bark or rotted softwood sawdust should be incorporated in soils of less than 2 percent organic matter prior to planting to greatly improve blueberry plant survival and growth. Hardwood sawdust is not as effective as softwood sawdust or peat moss for lowering soil pH. Undecomposed softwood sawdust should not be used. Steps 1 and 2 should be completed in the fall prior to planting in late February to late March, depending on location. If the organic matter is incorporated in the fall, any sulfur required to lower the pH can be added at the same time. Note: Water and nutrient management is difficult in pure organic material, and the plants are more likely to struggle and die. Plants: Two- or 3-year-old nursery plants 1 to 3 feet tall will transplant well. Keep the roots moist at all times between digging and replanting. Time: Late winter (February-March) as soon as the soil can be worked is best for bare-root plants; fall (November-December) planting has been successful on sandy soils with bare-root plants and in other areas with potted plants. Spacing: Southern highbush – 4 to 5 feet in the row and 8 to 10 feet between rows. Rabbiteye – 6 feet in the row and 10 to 12 feet between rows. Depth: Plant to the same depth that the plants were growing in the nursery or the container. Lightly firm the soil around the plant with your feet and water thoroughly. Cut Back: Remove all shoot tips that have flower buds (plump rounded buds). Avoid making cuts near the base of the plants that will provide an entryway for stem blight disease. To enhance survival and subsequent growth and development, prune away two-thirds of the top growth on bare-root and one-half on potted plants. Leave only one to three of the most vigorous upright shoots and any other growth near soil level. Surface Mulch Application: Organic material such as bark, wood chips, sawdust or pine straw as a 2- to 3-inch mulch on the surface after planting results in more uniform soil moisture, moderates soil temperature and generally promotes better growth and survival. Pine bark chips or sawdust have a pH between 3.5 to 4.5 and are more desirable than the same mulches from hardwoods with a pH above 5.0. However, surface-applied hardwood mulches have been satisfactory. Avoid sticky hardwood sawdust that will “seal” the bed and prevent water infiltration. Use Caution: Blueberries are easily damaged by excess fertilizer. Apply the recommended amount and allow 4 inches of rain or an equivalent amount of irrigation between applications. First Year: Do not fertilize immediately after planting. Wait until the first leaves have reached full size, then apply 1 tablespoon of a special azalea fertilizer (such as a 10-5-4, 10-8-8 or 11-7-7) within a circle 12 inches away from each plant. Repeat at about six-week intervals depending upon rainfall or irrigation until mid-August in the Sandhills and Coastal Plain, and mid-July in the Piedmont. Use a half-tablespoon of ammonium sulfate instead of a complete fertilizer for the second and subsequent applications if high levels of phosphorus are present as determined by a soil test. Second Year: Double the first year’s rates, but increase the circle around the plants to 18 inches. Make the first application when new growth begins in the spring. Bearing Plants: When growth begins in the spring, apply 1 cup of a complete fertilizer such as 10-10-10 within a circle 3 feet from each plant. For more vigorous growth, sidedress with a quarter-cup of ammonium sulfate at six-week intervals, but stop fertilizing after July 1. On mature bushes, 6 to 12 inches of new growth is adequate. Any additional growth must be pruned away to keep the plants from becoming excessively large and resulting in a loss in production. Judge the sidedressing requirement on the amount of shoot growth and leaf color. Lowering pH: If the soil pH is slightly high in an established planting based on soil test results, sidedress with ammonium sulfate, and apply iron sulfate if needed to correct the yellowing of foliage. If mulch is applied following planting and replaced at the rate of 1 inch per year, few weed problems should develop. Pine straw is acidic and makes an excellent mulch. Handpull or hoe the occasional weed growth. Avoid deep cultivation since blueberry roots are very near the surface. Hoe no more than about 1 inch deep. Since blueberries are produced from buds on 1-year-old wood, pruning should be severe enough to encourage the production of vigorous new growth each year. Because rabbiteye blueberries are vigorous and can support and develop heavy crops of large-sized fruit, they generally require less pruning than southern highbush blueberries. During the first five years little pruning will be required. Remove lower twiggy growth, dead or damaged shoots, and weak, spindly growth. Tip back excessively long and limber shoots to stimulate lateral branching and to thicken the shoots. Prune young plants during the dormant season and immediately after harvest with older plants. If plants become too tall to harvest easily, selectively remove about one-third of the older canes in the winter. Generally up to seven canes are left each year after pruning mature rabbiteyes, with the oldest or largest cane removed each winter beginning in the fifth year. These selective cuts should be made to open up the center of the plant to improve light penetration and to allow new canes to develop to replace old canes. Southern highbush blueberries require annual pruning to prevent overbearing and to maintain vigor. Prune during the dormant season; late winter is most desirable, especially in the mountains. If the flower buds were removed after planting, little pruning will be required the second year except to remove all flower buds and any weak, damaged or diseased growth. After two growing seasons, leave some flower buds on vigorous shoots to produce a small crop in the third year. To prune bearing-age plants, remove low spreading branches and branches growing through the center of the bush, especially weak and older branches. Cut back extremely vigorous 1-year-old shoots and remove most small slender branches. If earliness is important, remember that berries produced on small slender laterals will usually be the first to ripen, so this should be taken into account in determining the number of these shoots to remove. Also, long-fruiting lateral shoots need to be tipped back so that no more than four to six flower buds remain. Highbush blueberry plants generally reach their peak production between 8 and 10 years of age. To maintain bush vigor with the continued production of high-quality fruit, renewal pruning must be practiced. Begin the renewal process when the bushes are about 6 years old. First, remove any weak or diseased canes entirely. Among the remaining canes starting with the older ones, cut back about two per year either to strong lateral branches or to within 1 foot of the ground. New strong lateral branches will usually develop below the cut. Through renewal pruning, a new upright framework can be developed over a four- to five-year period. Blueberries may be troubled by fungal leaf spots, fruit rots, root rot and gray mold. The primary insect problems are cranberry fruitworm (which ties berry clusters together with silk), Oberea stem borer (the larva bores down the stem resulting in stem death), Japanese beetles, and yellownecked caterpillars. The latter two insect pests feed on blueberry foliage. The yellownecked caterpillars (Datana ministra) feed in groups and can quickly strip all of the foliage from blueberry stems. Bird Protection: Birds also harvest blueberries, often the complete crop from a small planting. Plastic or cloth netting draped over the bushes or supported on a framework is the only practical control. Frequency: Southern highbush blueberries have the best quality when picked every five to seven days depending on temperature. Rabbiteye flavor improves if berries are picked less often, about every 10 days, which allows for maximum flavor with few soft overripe fruit. Taken from “Small Fruits in the Home Garden,” by E.B. Poling, North Carolina Master Gardener Manual, NC State University. Important stages in the development of fruit and vegetative growth in blueberries: (A) dormant stage after leaf drop showing one flower bud; (B) blooming stage that shows the cluster of flowers and vegetative shoot that developed from the top two buds of the dormant stage; (C) fruit set stage where pollinated flowers begin developing into small fruits; (D) fruit development stage that extends from fruit set to mature fruit. Both flower and vegetative buds for the next season are often easily recognized on vegetative shoots at the time fruit ripens.